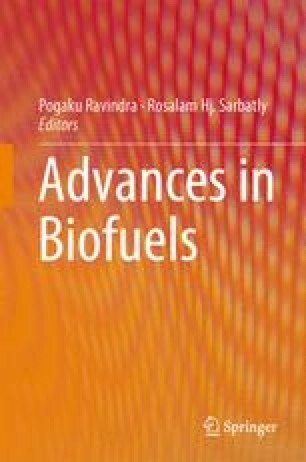 This chapter highlights the potential of utilising biomass as a renewable feedstock to produce biofuel and biochemical. Technologies for the conversion processes are discussed. In addition, case study on biomass conversion to H2 is presented. The effect of steam and newly developed bimetallic catalyst (Fe/Ni/Zeolite-β) on palm oil wastes including palm shell (PS) and palm oil fronds (POF) decomposition for H2 production was experimentally investigated in thermogravimetric analysis-gas chromatography (TGA-GC). Presence of steam increased the H2 content by 28% for both palm oil wastes. Maximum H2 content in the product gas generated was 64 mol% from PS for the catalytic steam gasification. On the other hand, for POF maximum H2 content of 50-mol% is observed in the product gas. Palm wastes can be a potential feedstock for H2 production utilising catalytic steam gasification process and can contribute to considerable renewable and clean energy for future.